For equestrian couples on vacation, all you need is love...and a horse! Check out these romantic horseback riding vacations that are perfect for Valentine's Day, or any other occasion where you need to sweep your sweetheart off of their feet. What better way to celebrate your love than with a romantic horseback riding getaway for two? Equitrekking.com has searched the world over for the most romantic destinations that are sure to impress your Valentine. These equestrian vacation destinations set the stage for romance--thanks to special packages designed for couples, luxurious accommodations and amenities, or jaw-dropping locations that are sure to put stars in your lover's eyes. 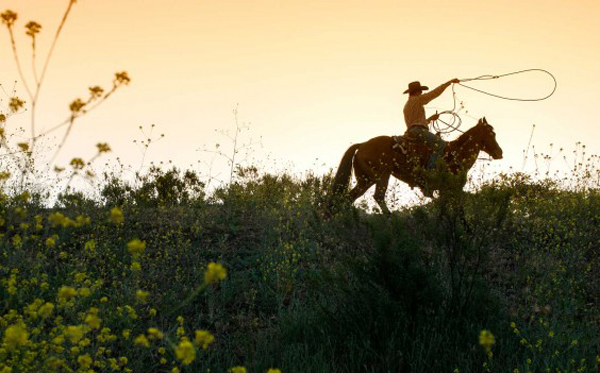 Sip your way through Santa Barbara wine country on horseback. At Alisal Guest Ranch and Resort in Solvang, California, couples can enjoy a romantic western getaway in the heart of California wine country. 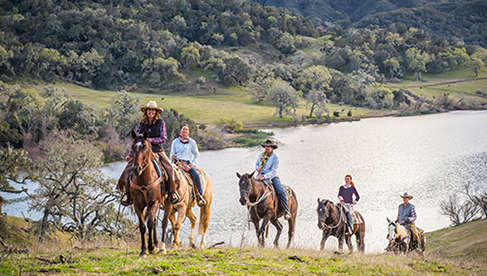 Nestled in beautiful Santa Ynez Valley, this 10,000-acre working cattle and guest ranch offers over fifty miles of horseback riding trails through scenic canyons and meadows--perfect for wildlife spotting, or maybe even a proposal. Guests can choose from several romantic packages, including the Wine & Roses Romance Package--which features studio accommodations, a gourmet picnic basket for two with a bottle of wine, complimentary wine tastings at nearby wineries, and more. And yes--sparkling wine, roses, and chocolate covered strawberries will greet you in your studio upon arrival. Experience the romance of the West alongside your loved one. Photo courtesy Alisal Guest Ranch and Resort. Cozy up in Colorado's winter wonderland. Nothing's quite as swoon-worthy as cuddling up with your sweetheart in the snow. At the C Lazy U Ranch in Granby, Colorado, an all-inclusive luxury dude ranch in the heart of the Rocky Mountains, you can play all day enjoying horseback riding tours and a variety of other fun-filled winter activities like skiing, snowshoeing, and ice skating. Afterwards, warm up with a delicious meal or drinks by the fire at The Bar at C Lazy U Ranch--which boasts an award-winning wine list. The ranch offers a variety of accommodations to choose from--including luxury villas with private hot tubs, and cozy cabins with decks overlooking the ranch. Winter time guests can also enjoy the services of the award-winning Lazy You Spa- right in the comfort of their room. Editor's note: This romantic destination might be the perfect option for couples traveling with children. For President's Day weekend, the ranch is offering a special package (with an option for early arrival on Valentine's Day), featuring a supervised children's program. Now, mom and dad can steal away for a romantic day alone, while the kids enjoy fun activities while under the watchful eyes of a ranch counselor. 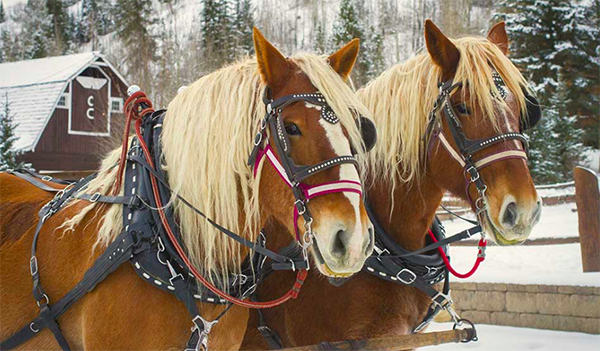 Snuggle up on a romantic horse-drawn carriage ride. Photo courtesy C Lazy U Ranch. Spice it up with an equestrian rendezvous at this Andalucian riding school in Spain. At Hacienda Horses at Cortijo Uribe, cast a spell on your sweetheart with wine, scenery, and the brio and beauty of fine Spanish horses. Tucked away in Mollina, this beautiful hillside retreat offers tailored horse riding holidays amidst the scenic Andalucian landscape. 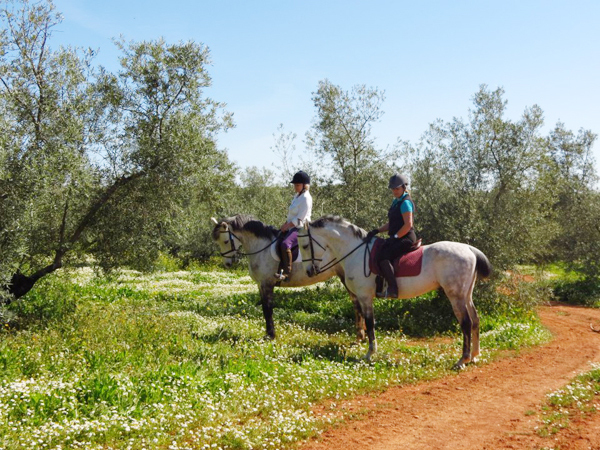 This riding school and vacation destination offers lessons with Andalusian and Pura Raza Espanola horses for riders of all levels, but serious equestrians can enjoy dressage and advanced riding clinics with Instructor Antonio Camacho. 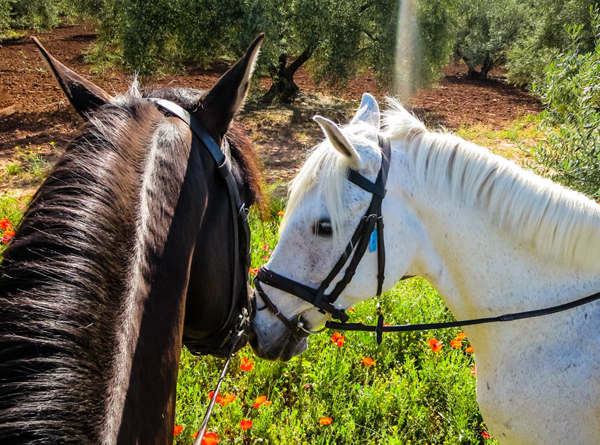 Enjoy leisurely rides with your love through picturesque olive groves and vineyards, or schedule a full moon ride for the ultimate in equestrian romance. After riding all day, take a dip in the infinity pool while enjoying sweeping views of the Spanish countryside. Spacious and unique accommodations inside a 16th century Cortijo building, beautifully decorated with antiques, are sure to set the mood for an unforgettable evening of romance. A horseback stroll through wildflowers with Hacienda Horses. The horses of Cortijo Uribe. Photo courtesy Hacienda Horses. 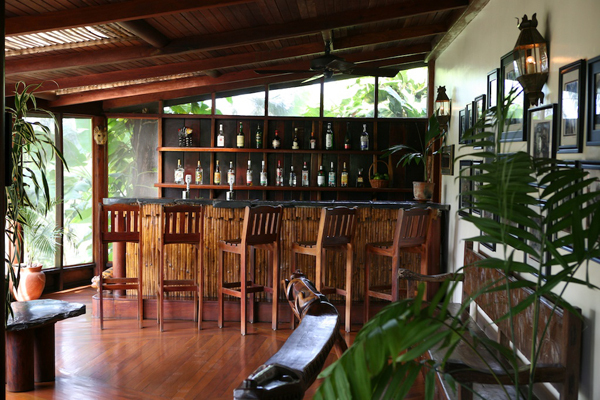 Fall in love with Francis Ford Coppola's eco-friendly rainforest getaway in Belize. For a truly over-the-top romantic gesture, steal your love away to Coppola's tropical hideaway in the Belizean rainforest. 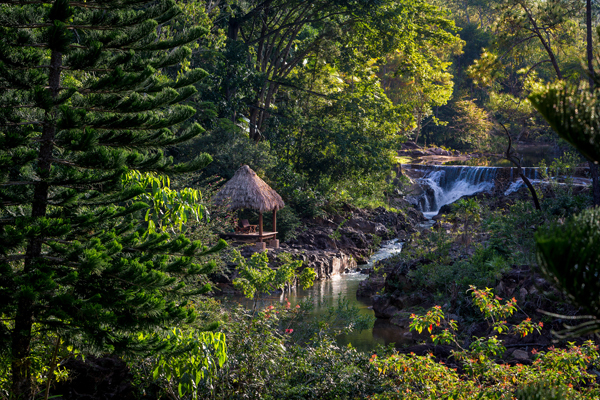 Once a private family retreat, Blancaneux Lodge offers several equestrian rainforest tours through the Mountain Pine Ridge Reserve, including a full day's ride to a secret waterfall--perfect for popping the question. Wildlife seekers won't want to miss the sunset ride through Noj Kaax Meen Elijio Panti National Park, a 16,000-acre Mayan nature preserve that is home to tapir, ocelot, and even jaguar. Explore Mayan cave systems and ancient ceremonial sites. Afterwards, cozy up to the Jaguar Bar, where you'll sip signature cocktails beneath the ceiling fans seen in Apocalypse Now. Enjoy a candlelit dinner amongst the trees at Montagna Ristorante--an Italian restaurant featuring Coppola family recipes made with local and organic ingredients. Guests can choose from a variety of rustic but glamorous accommodations including charming thatch roof cabanas to stylish villas with viewing decks and panoramic views. Lovers looking to splurge can even stay in Coppola's personal villa, complete with a full-time attendant and even a private pool. Cinematic beauty awaits visitors of Blancaneaux Lodge. Photo courtesy Blancaneaux Lodge. Sidle up the Jaguar Bar for drinks served up with Hollywood style. Photo courtesy Blancaneaux Lodge. Seek romance on a once-in-a-lifetime horseback riding safari in Botswana. If your loved one is a fit and proficient rider with a penchant for thrill-seeking, then Okavango Delta Horse Safari will certainly fulfill their heart's desire. 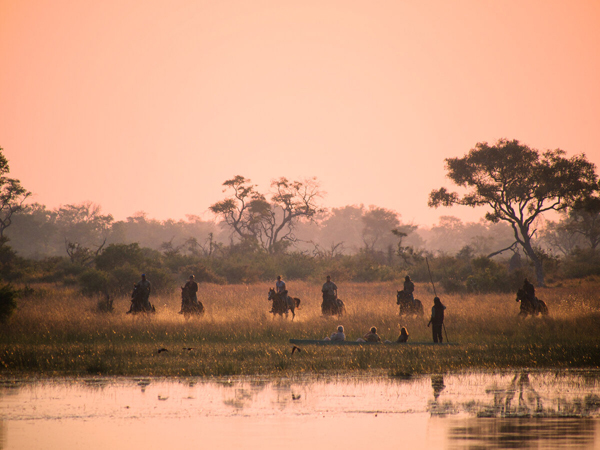 Situated on the Okavango Delta and bordering the Moremi Game reserve, this award-winning riding safari leads lovers through the African wilderness on a string of experienced horses, including Thoroughbreds, Arabs, and their home-bred "Botswana Warm-Bloods." Guests can plan to spend four to six hours in the saddle per day, exploring the diverse landscape and tracking the plentiful wildlife. The delta is surrounded by the dry Kalahari Desert, so it serves as a magnet for wild game, who flock to the area's abundant water supply. Depending on the season, travelers might see elephant, zebra, wildebeest, and giraffes, and more. Qualified guides with expert knowledge of the terrain and wildlife are with you at all times, and safety precautions are taken when viewing any dangerous game. 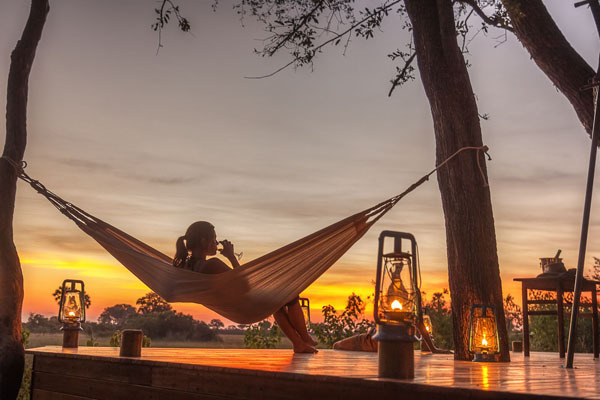 This safari adventure consists of three different camps, each offering unique accommodations amidst distinct areas of the delta. From luxury accommodations that feature peaceful river-side views, wifi, and a swimming pool--to champagne and brunch in a treehouse; this is the ultimate horse safari escape. Gallop on horseback beneath an epic African sunset. Photo courtesy Okavango Delta Horse Safari. Okavango Delta Horse Safari offers couples an array of luxurious bush accommodations. Photo courtesy Okavango Delta Horse Safaris. 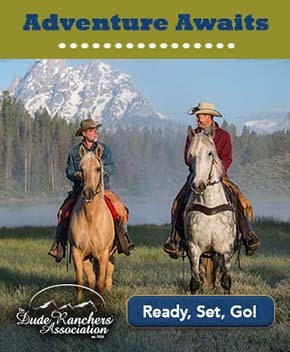 Check out more great ranch and global horseback riding vacations in the Equitrekking Vacation Guide.